The Blessed Virgin appeared on Saturday, December 9, 1531 to a native Mexican named Juan Diego (1473 - 1548) who was hurrying down Tepeyac Hill to go to Mass in Mexico City. The Virgin sent him to Bishop Zumárraga to have a temple built where she stood. She was at the same place that evening and Sunday evening to get the bishop's answer. The bishop did not immediately believe the messenger, had him cross-examined and watched, and he finally told him to ask the lady, who said she was the mother of the true God, for a sign. Juan agreed readily to ask for the desired sign, and the bishop released him. Juan was occupied all Monday with his uncle, Bernardino, who was dying of fever. Indian medicine had failed, and Bernardino seemed at death's door. At daybreak on Tuesday, December 12, 1531, Juan ran to nearby Saint James' convent for a priest. To avoid the Lady, he slipped around where the well chapel now stands. But the Blessed Virgin crossed down to meet him and said, "What road is this thou takest son?" A tender dialogue ensued. She reassured Juan about his uncle, to whom she also briefly appeared and instantly cured. 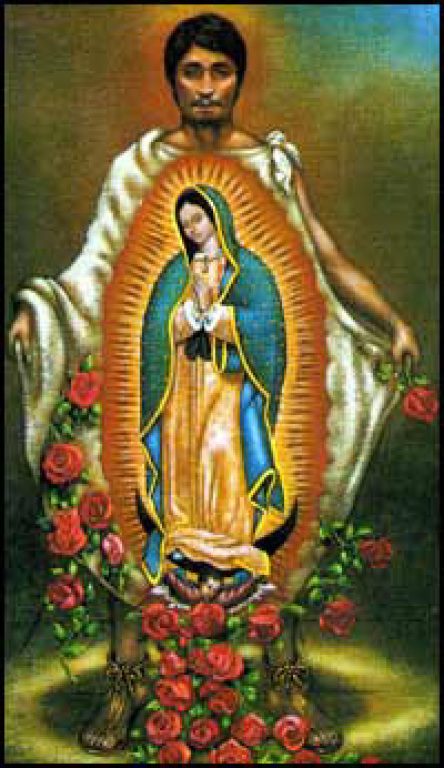 Calling herself Holy Mary of Guadalupe she told Juan to go to the rocks and gather roses. Juan knew it was neither the time nor the place for roses, but he went and found them. Gathering many into his tilma, a long cloak used by Mexican Indians, he came back. The Holy Mother rearranged the roses, and told him to keep them untouched and unseen until he reached the bishop. When he met with Bishop Zumárraga, Juan offered the sign to the bishop. As he unfolded his cloak, the Castilian roses (which are not grown in Mexico), fresh and wet with dew, fell out. Juan was startled to see the bishop and his attendants kneeling before him staring at the tilma. The life size figure of the Virgin Mother, just as Juan had described her, was glowing on the tilma. The picture was venerated, guarded in the bishop's chapel, and soon after carried in procession to the preliminary shrine. She was honored with the title Patroness of the Americas and thousands converted to Christianity. St. Juan Diego was canonized by St. John Paul II in July 2002 and is the first indigenous saint from the Americas. His feast day is December 9. The coarsely woven material of the tilma which bears the picture is as thin and open as poor sacking. It is made of cactus fiber, probably maguey. It consists of two strips, about seventy inches long by eighteen inches wide, held together by weak stitching. The seam is visible up the middle of the figure, turning aside from the face. Painters have not understood the laying on of the colors and have determined that the "canvas" was not only unfit, but unprepared. They and other artists find the proportions perfect for a maiden of fifteen. The figure and the attitude are of one advancing. There is flight and rest in the eager supporting angel below the lady’s feet. The chief colors are deep gold in the rays and stars, blue green in the mantle, and rose in the flowered tunic. Sworn evidence was given at various commissions of inquiry corroborating the traditional account of the miraculous origin and influence of the picture. The place, called Guadalupe Hidalgo since 1822, is about five miles northeast of Mexico City. Pilgrimages have been made to this shrine almost without interruption since 1531. A shrine at the foot of Tepeyac Hill served for ninety years, and still forms part of the parochial sacristy. In 1622 a shrine was erected, and in 1709 a newer one. On the same land are a parish church, a convent and church for Capuchin nuns, a well chapel, and a hill chapel, all constructed in the 18th century. 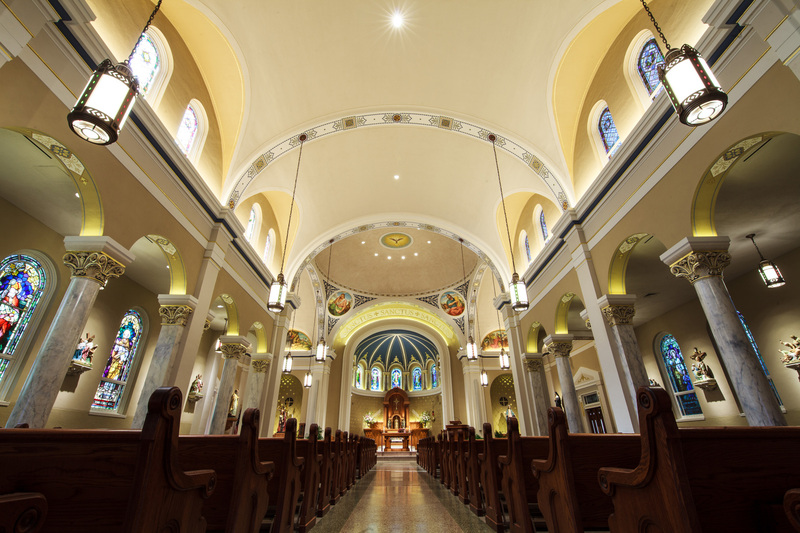 In 1904, it became a basilica, with the presiding ecclesiastic being called abbot. The shrine has been renovated in Byzantine style which presents an illustration of Guadalupan history.